One of my favourite hikes in Rio de Janeiro has got to be Dois Irmãos. Having been up there four times now – once even to celebrate Christmas Day at the top – I feel like I’m beginning to know the way up like the back of my hand. Despite this, the view from the top never fails to amaze me. It’s picture-perfect, capturing Ipanema’s wonderful coastline with Lagoa to the left and the ocean stretching out endlessly to the right. The hike up takes about 40 minutes through the forest with the occasional viewpoint to stop at, but before you get to the entrance of the trail, you need to go up to the top of Vidigal favela. Want to check it out? 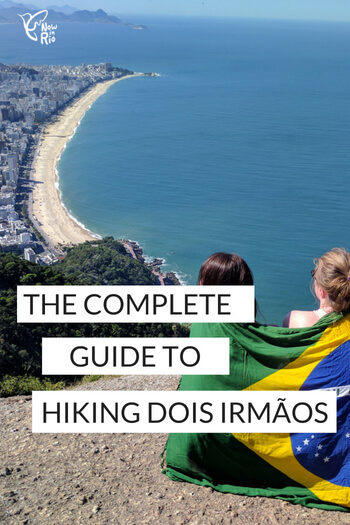 Then here is everything you need to know about hiking the Dois Irmãos. First of all, where is the Dois Irmãos? The Dois Irmãos (which translates to the ‘two brothers’ in English) are two peaks in between São Conrado and Leblon. You will instantly recognise them whenever you go to Ipanema or Leblon beach; they are the two pointy mountains at the end of Leblon and are iconic features of the beautiful scenery there. Before setting off, what should you bring with you? Water – it gets hot going up, especially if you are hiking in the summer period. Bring a couple of litres with you. Food – It takes about 40 minutes to go and the same to go back down. As you may sweat a lot on the way up, it’s good to take food with you to replenish any lost minerals and salts plus to restore energy. Normally a couple of sandwiches and a banana is ok. Sunglasses – when we at Now in Rio went up, Yvonne took her sunglasses and could admire the view with ease. I, on the other hand, didn’t take mine and had to admire the view through squinty eyes and a shielding hand. Sunscreen – the top is totally open and exposed so it’s easy to burn. I use factor 60 on my face and factor 30 on my body. Mosquito repellent – to be honest, I didn’t need this and despite being someone that attracts mosquitos within a five-kilometre radius, I didn’t get bitten once. But if you’re concerned about bites, bring it with you just in case. Baseball cap – for the same reasons as the sunglasses. Camera – you will want to get some awesome photos on the way up and at the top. *Optional. A Brazilian flag kanga (beach towel) – we saw a couple using a Brazilian flag at the top to help them take the perfect travel selfie. It may seem cheesy to some, but it actually makes a nice photo to remember Brazil and the hike. Cash – for the van or motor taxi going up Vidigal (more on that later), plus for the bus there and back, plus for extra food or drinks. Plastic bag – to keep your rubbish in to throw away later. What should you wear? Shorts and a strap top are totally fine. Anything loose and comfortable is recommended. Wear trainers (or sneakers for our American friends!) for the hike. It’s not a particularly difficult hike so hiking shoes or a hiking stick aren’t necessary. So, how do you get there? I’ll assume you are in Ipanema as that’s the easiest starting point and that was where we started. If you are going from Praça General Osório you can take the regular public 525 bus (R$3.60) that will go straight there. 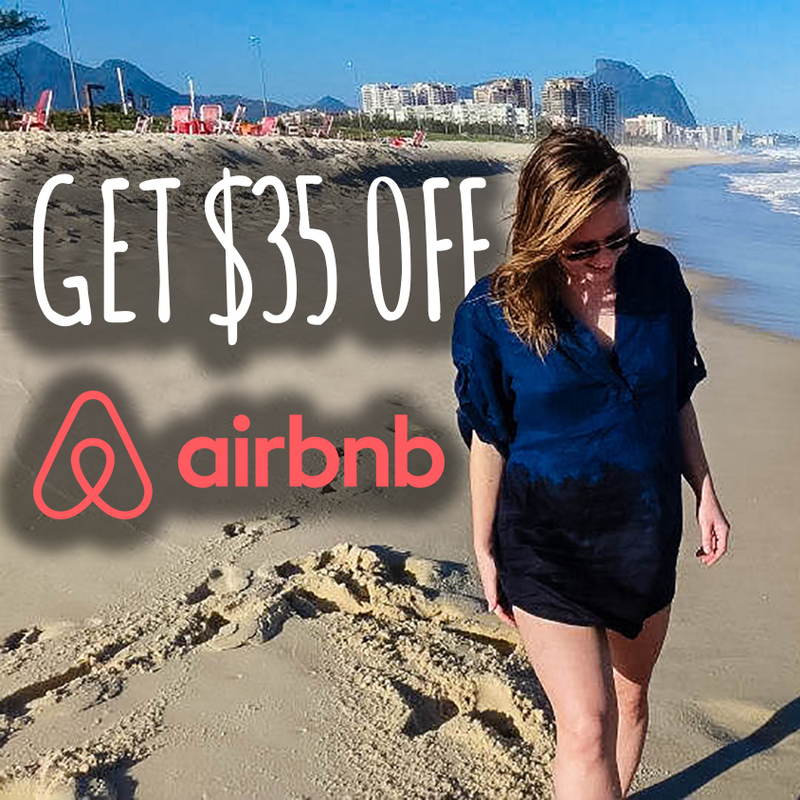 Alternatively, go towards the beach and from there, you can take the regular public 104 bus (R$3.60) or the 557 (R$3.60). The latter two options are a bit quicker. These buses go along Avenida Niemeyer and will drop you off in front of the Vidigal favela. It will take about 30 minutes to get there. But wait! What if you are going early on a regular weekday morning? Why does this even matter? Well, Avenida Niemeyer is open to only one direction of traffic in the morning that is coming in the opposite direction to which you want to go. Your bus options, in this case, is to take the bus that goes all the way round towards Rocinha and goes back down Avenida Niemeyer towards Ipanema. It’s a much longer route. But I have a better alternative for you and it’s the one that we did when we did it early on a Tuesday morning. We took a bus to the end of Leblon where we got off. From there, we walked to Vidigal which took only about 20 minutes. Not only is it quicker than going all the way around, the path follows the coastline and offers gorgeous sea views. It’s totally worth it and will get you warmed up for the hike. The entrance to Vidigal is easy to spot – it’s a large, wide opening with traffic going in and out and a sprawling favela behind it. If you’re not sure if you will spot it, you can ask the bus driver to tell you when (simply say ‘Vidigal’ and he or she will be able to understand you want to go there). If you’re walking, you honestly won’t miss it. Below is a photo of the views if you walk from Leblon along Avenida Niemeyer to Vidigal. Below that is the Vidigal entrance. Once you’re there, you need to get to the top of Vidigal as that is where the entrance is. This means going through a favela. Is this dangerous? No. Vidigal has had a solid clean reputation for years and is one, if not THE, safest favelas in Rio. Tourists visit every day and some expats even live there (there are rumours that David Beckham has a house there which I find fascinating but I’ve never been able to confirm if this is actually true). You don’t need to worry. 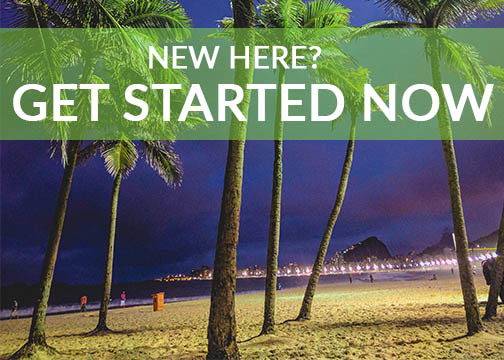 Use the hike as an opportunity to briefly get to know a unique and cultured community in Rio. So, how do you get to the top? You have three choices – walk (I don’t recommend this. It is a long, steep hill to the top and you will be exhausted before you’ve even started the hike), take a van, or take a motor taxi. The van is a small Kombi-van and charges about R$7 to get to the top. Personally, I prefer the motor taxi (it’s R$5 for one-way. Make sure you negotiate before taking the motor taxi to avoid being overcharged). It’s quicker and way more exciting than being in a van. Safety precautions on the motor taxi are taken quite lightly though – it’s not unusual to be given a helmet twice the size of your head and you spend the whole journey clutching on to it as your head rattles around inside trying not to think about how much it will hurt if you fall off. If you do get given a poorly-sized helmet, simply ask for another one and trust the driver to take you safely to the top. They seem almost too at ease navigating up the steep hills and weaving in and out of cars, other motor taxis, and vans, but they do this several times a day and are skilled at what they do. The main concern you have to have is to get on and off the correct side to avoid touching the hot metal of the exhaust pipe. I learned this the hard way and three years later, I still have a faint scar to this day. So you’ve got your motor taxi or van, or you have crazily walked to the top, and now you are at the entrance. What do you do now? So the motor taxi and van drivers will leave you at the correct spot – you simply need to say ‘trilha’ which means hike or ‘Dois Irmãos’. From the road, go through the gates that go onto a sporting ground with a football court and some outdoor workout equipment, walk straight on towards the trees (so don’t turn right, just walk straight ahead) and you will see a small entrance into the forest. This is the beginning of the Dois Irmãos hike. The picture below shows where the van or motor taxi will drop you off (where the red star is). From there, walk past the sports ground until you see the entrance into the forest. This is the Dois Irmãos entrance. From there on up, it’s just a case of simply following the trail up. There are no routes that will lead you astray; just keep following the well-trodden path. There are three viewpoints on the way up, including one of my favourites which overlooks Rocinha. These are great places to stop, take a rest, drink some water and admire the views. If you forget your water, then no problem. Halfway up, there is a vendor that sells water and other soft drinks as well as basic and simple snacks, including acai. It’s good to take cash with you (ideally small notes and change) in case you want to buy anything there. The whole hike takes about 40 minutes and you can stay as long as you like at the top. Some people go early to watch the sunrise or late to watch the sunset – both are highly recommended. The walk back down takes about the same time as some parts are a little steep and need some careful navigating down. But all in all, it’s not an overly challenging hike, but an immensely rewarding one. This video is when Yvonne did the sunrise hike. Totally worth waking up at a crazy hour of the morning to do it. The photo is one of the viewpoints on the way up that overlooks Rocinha. Once you’re back down, from the entrance, you can either get a motor-tax back down (just be aware that they don’t hang around waiting at the top like they do at the bottom so you may wait a while for one to come) or simply walk down. I personally love walking down as it’s a great chance to see the community up close and check out the amazing ocean views on the way down. There are also a few bars and restaurants you can stop in for a well-deserved caipirinha – Alto Vidigal or Bar da Laje are two that are great to check out. From the bottom, you can either leave the favela and cross the road to get to the bus stop that is right opposite. Pick any bus that has Copacabana written on the front (there are loads) and that will take you back to Ipanema. Or you can pick up an Uber which costs about R$10 to get back to Ipanema. Like I’ve said, I’ve been on this hike four times and I love it a little more each time. If you can only do one hike in Rio, make it this one.